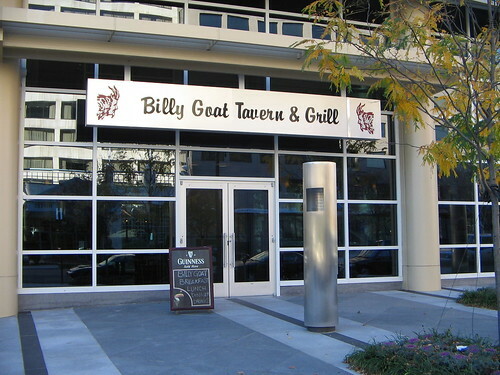 The Billy Goat Tavern has come to Washington, just around the block from where I live, so now I can pop in for a cheezborger at just about any time of the day. I met the manager of the DC Tavern at a tenants’ association meeting two weeks ago; he’s a great-nephew of the original Billy Sianis (and also named Billy). Nice guy. Excellent location, on the ground floor of the National Association of Realtors HQ, just up New Jersey Ave from the Capitol. Lots of windows, separate counters for bar and dining, giving the tavern an air of DC legitimacy. Probably my only complaint is that smoking is still allowed in there, so the air inside isn’t exactly fragrant when someone lights up. 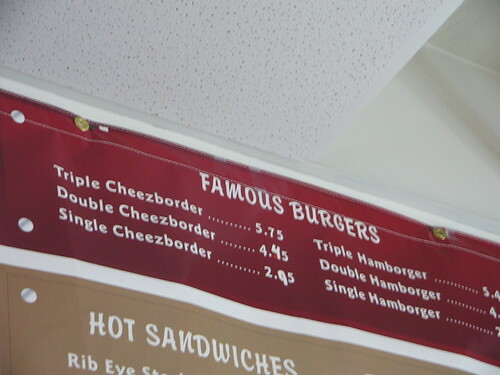 Here’s a closeup of their menu. I’m assuming the “d” is a printer’s typo. A cinematic tour de force. That was more compelling than the Lumière Brothers Arrival of the Train at La Ciotat. It looks like they serve Guinness. Isn’t that the most important thing for any tavern?